A maddened Trump leans over a panel filled with buttons, gauges and switches; a headlamp emitting vivid artificial light sways from side to side as his hand hovers over one big and glistening red button that reads ‘nuke North Korea’. Variations of this theatrical scene have been portrayed by the media since the possibility of a Trump presidency became, well, a reality. Instead, no one quite predicted the mise-en-scene would look much more like a warmly lit, ancient Greek-inspired decor in a Mar-A-Lago lounge. A reclining Trump perched with his mobile phone tucked comfortably in his palm. The array of confusing switches and one unmistakeable red button have been replaced by a compact screen, a light-blue bird, 140 characters and Trump’s complete autonomy over how he choses to ‘be more clever’. While the US-North Korean standoff has evolved to fit the medium of generation Y, it’s theatricality remains similar to that of the Cold War; two nuclear armed nation-states, the US with the largest army on earth and North Korea falling not far behind at number four, at least in numbers. The military technology has advanced – at least that’s what they tell us. North Korea has exploded nuclear weapons in five tests, twice in 2016. 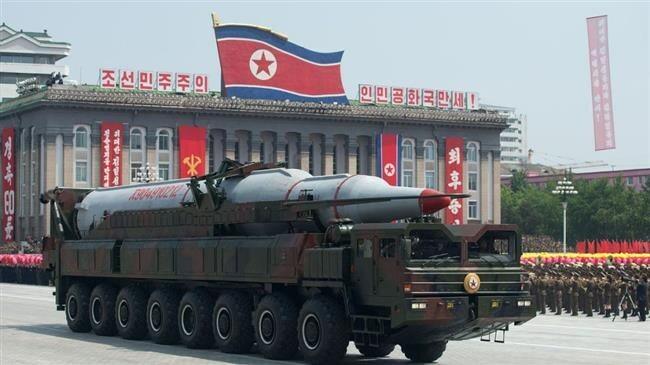 Jong-un’s army has developed intercontinental ballistic missiles that can travel 4,000 miles they say. Both parties are ready, hands steady as Trump’s midnight Twitter flurries, to sacrifice the South Pacific American territory island of Guam for the benefits of shaking their tail feathers. Of course both sides are playing with high stakes, Jong-un is determined to retain his highly controlled dictatorship at any cost – leaving North Korea in a detrimental state of poverty for the investment of the world’s fourth largest army and its nuclear weapons. And the other protagonist Donald, is adamant to show he has no fear of using “fire and fury” should he be provoked. “Trump could be North Korea’s greatest nightmare and its greatest opportunity” says Scott Snyder, a spokesperson for the Council of Foreign Affairs. With that there’s little argument. Trump’s impulsive, unpredicted outbursts can drive Jong-un to act impulsively himself. Yet knowing that Jong-un’s ultimate goal is to halt any attempt to overthrow his government, “the chances of Kim being able to cut a deal with an unconventional Trump are higher than they would be with a president more sensitive to the politics of nuclear diplomacy with North Korea.” Snyder adds. Trump’s lack of humanitarian empathy also makes for a good ingredient in the mix. Despite Trump’s Hollywood-esque declarations, and unlike a grandiose movie finale where the world burns in flames with flying shards of glass; the possible consequence of such provocations is very much real. And no one, not even Trump himself could walk out after the credits finish and classical music serenades ‘The End’.